Duncan Bradshaw lives in the EPIC county of Wiltshire in Southern England, with his wife Debbie and their two cats, Rafa and Pepe. Obsessed with zombies, GTA and biscuits, he wiles away his free time writing awesome stories, playing video games, drinking Guinness and hitting people on the head with a stick. Sometimes all while smoking his manly pipe. We had a chance to catch up with Duncan recently. Once the smoke from his manly pipe had cleared and he'd finihsed hitting us on the head with a stick we I had the opportunity pick his brain about the things that make him tick, his choice pick of zombie killing weapons and why a 3000 volt tazer-hand might come in very handy for every day life. 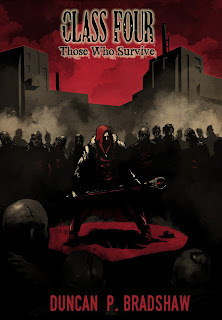 He're what the author of Class Three and Class Four: Those Who Survive had to say. 1. 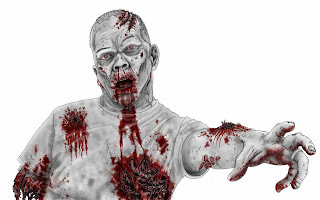 Why Zombies and how did they become the focus of your first two novels? I’ve been pretty obsessed with zombies since I watched Dawn of the Dead as a kid. Since then, I’ve watched the films, read the books, played the video games, worn the socks, you name it. I’m probably the easiest person in the world to buy presents for, well, as long as you don’t buy me something I already have. Then we’ll have the whole awkward situation, where I have to put on my fake smile, and go ‘great…thanks’, and you’ll totally know. Any chance of us camping for a fortnight on the Isle of Man next November is out of the question then. Anyway…back in 2006, I came up with what would become the first chapter in my debut novel, Class Three. Just a mix of procrastination, drinking and playing video games meant that I didn’t do anything until mid-2014. A couple of friends of mine self-published their work, and I saw that the ability to be able to turn my ideas into something real, was possible. Although I am writing books on subjects other than the undead, which is weird, I know that I’ll always want to write books on zombies. Now that I’ve created my own apocalyptic world, I’ve got loads of ideas on how to bring this dead world to life and build my own canon. 2. Do you mostly write in the morning, daytime or the witching hour? Most of my writing is done in the evening. With a full time job, I tend to get home, cook tea and then sit down in front of the laptop and get as much down as possible. At weekends, I tend to start around midday. This gives my brain a chance to mull stuff over and then I have a good five-six hours’ worth, before I wind down for the evening and spend some time with the wife. 3. Which author has had a major influence on your work and why? Can’t say I’m particularly influenced by any one author. There are certainly ones that I enjoy, Max Brooks’ WWZ and Zombie Survival Guide are the peaks of undead fiction for me personally. And humour-wise, Danny King’s ‘Diary’ series really floats my boat. When I come to my own work though, I just try to write my way. My rule of thumb is to write my books as if I were telling the story to mates in a pub. Sure certain sections require different vernacular and mannerisms, but otherwise, I write it as I would say it. A lot of people want to emulate their favourite authors, which is their own choice, I just want to write my way. 4. Which book, or books, do you think everyone should read? 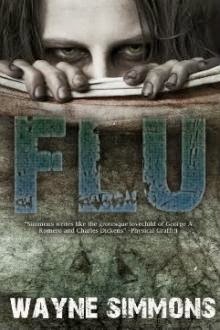 If you’re into zombies, there is only one book you should read, and that is World War Z by Max Brooks. An undeniable classic. The way it’s structured through interviews and tales of survivors through the apocalypse, recounting acts of heroism or selfishness, it pulls you in. There are interviews and brief snippets in there which could be expanded on even further and made into full blown novels themselves. Aside from that, the Walking Dead comic is a must as well. I wait for the yearly hardback, so gorge myself on it for a day and then go cold turkey for another twelve months. Kirkman absolutely nails the sheer brutality of the zombie apocalypse. No one is safe, don’t get attached to any character, cos chances are high that at some point they are going to die. 5. 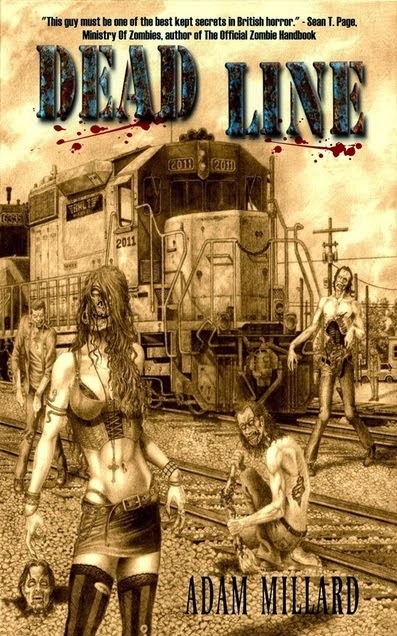 Do you think zombie fiction is finally getting the recognition it deserves? I think with the vast array of zombie fiction these days, it can be difficult to find the brains from the stringy bits of vein, but not impossible. Ultimately, with any hugely successful sub-genre, people will point to the stuff which is sub-par or not really adding anything, probably because it’s quite an easy thing to do. But…as with any genre, if you look hard enough, there are some really good stories being told. A lot of people lay the dearth of quality firmly at the door of self-publishing, I don’t subscribe to that. I think you’ll find that a lot of the original ideas are actually coming from these people. The inevitable problem is that, like music, you can only take zombies so far, which is why it is key to introduce new types, new ways of infection, or different focus. Personally, I like a bit of action in there, to help balance out the reflective moments, but I want to know how people are surviving in the end of the world. Plus, with any apocalyptic setting, you get the proper bad guys, the humans who use the scenario to their own end, and with that, you have a huge array of opportunity. 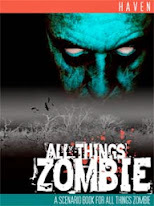 One advantage of the sheer size of the zombie genre, is that there really is something for everyone, and that can only be a good thing. 6. Zombies – slow or fast? 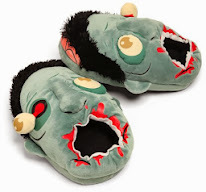 Whilst I can understand the modern day upgrade of the undead to parkour running athletic chompers, I’m a Romero purist. The big draw to me as a kid when I was introduced to zombies, was the inexorable feeling of dread you get from seeing a slow moving horde shuffle its way towards you. Your brain is telling you that escape is a foregone conclusion, but you’re still looking at them, you’re distracted. If your mind isn’t on the prize, you’re going to make a mistake and before you know it, your intestinal tract is going to be hauled out from its internal cavity and used to feed the dead. I’m not completely averse to the undead moving faster; just I think that is more an indictment on our way of life in a 24 hour, always on society than anything. Plus, you could argue, that by making them run, you are doing something different, and that is no bad thing. 7. Blunt instrument, firearm or blade? Oohhh, now you’re getting into the nitty gritty. Well, firearms have to be ruled out, for one, they’re not exactly prevalent in the UK and two, the noise. This isn’t to say that if you got your hands on an AK-47 during the apocalypse, you should trade it for a packet of custard creams. It would come in handy in a do or die situation, or against raiders. I personally err more towards an axe, the all metal ones, you don’t want no wooden handle and metal head one. Let’s say you have just crudely ventilated a zombies head, and are trying to retrieve the weapon before their mate tucks into you. The last thing you want is yanking it out, only to find that you are left holding what amounts to a big bit of kindling. Baseball bats would be pretty handy I think, same as cricket bats. A well-made piece of wood will always hold you in good stead. Just stick clear of swords (useless in confined spaces) or golf clubs, you’ll get one good hit in if you’re lucky, before you’re left holding a bent piece of metal. One thing to bear in mind is that cracking open a skull with an implement is not as easy as it looks in films. At this point, my solicitor has advised me to add the word ‘allegedly’. Like anything in life, make sure that whatever you use is well made, and that you are comfortable using it. 8. If you could save just one luxury, what would it be? I’d have to take a leaf out of ‘The Battery’ here and save my iPod. Yes, I know that you won’t be able to charge it once the power goes, and you don’t want it on whilst you’re mooching around a building. But if you’re holed up somewhere, it’d drown out the morale-sapping moans of the undead. Plus, music can get you pumped up before you have to do something, like venturing out for supplies or dealing with one of the group who says they haven’t been infected, but you know that they are. 9. What do you think is most likely to cause an actual zombie outbreak? I think it’s more likely to be something which is human made, escapes from a research facility or intentionally released by someone who is a bit irked. Maybe they didn’t get offered the last Rolo? Maybe they tired of people posting pictures of their dinner on social media? Regardless, they’ve taken it upon themselves to level the playing field. Or…my outside bet? Some form of extra-terrestrial material. A meteor breaks up in our atmosphere, and the compounds react with the air and before you know it, everyone is a ticking zombie time bomb. 10. 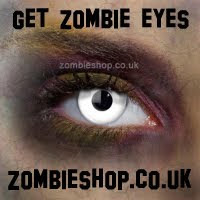 What is your number one piece of advice for surviving a zombie apocalypse? I think we’re quite lucky in the UK to have one important facet installed within us all. The inability to trust others completely. We’d always be wondering if Mrs Jenkins is keeping her and her family to themselves, for reasons other than what she said about the third Thursday of every month is ‘staying in the cupboard day’. I’d wager you a Mint Club bar that her youngest is one of the undead, and she’s feeding him hacked off appendages. Honestly, the main thing, as in life these days, is common sense. If something seems a bit dodgy, then skip it. Don’t risk your own life and those who depend on you, because you want to go and pet a cat. In a house. With bloody hand prints all over the walls and door. Which is on fire. And Rolf Harris is there. Just move along, nothing to see there, okay? 11. If you were a character in one of your books, what would be your opening line? It would have to be in keeping with the level headed, erudite, amazing and thoroughly modest person I am. Oh, and sarcastic. I think a witty one liner, just before I get eaten, I’m thinking me and a chum find a corpse with the top of their skull missing, and something has picked out some of the brains and it looks a Mr Whippy, I’d say ‘Do ya want a flake in that?’ before the open topped zombie starting chomping on the larger of my two testicles. 12. Does music play a part in your creativity? Definitely, tend to have music playing in the background, sometimes it’s contextual, so Red Dead Redemption soundtrack was handy for a section in my new book, or Vangelis for something with aliens in it. Otherwise as long as it’s not too distracting, pretty much my ‘usual’ sort of music. 13. If you had to live in a clichéd alternate reality would you choose medieval fantasy, futuristic sci-fi or something else? I’d have to go for futuristic Sci-Fi, the kind we were promised as kids. So flying cars, every meal is in some form of tablet form, dogs have aerials on their heads and people wear silvery jumpsuits. Oh, and endless adverts showing on the side of HUGE airships. Everything is bright and sunny, or as I call it, annoying. People would also have really stupid sayings, so instead of saying ‘hello’, they’d say things like ‘vulvic connotations to you’. Plus they’d be smiling, all the time. Yeah, I can’t say I’m too happy about it either, but hey, flying cars RULE. 14. If you had a super power, what would it be? This is probably going to be more about the things that bug me, but I’d quite like to have an electric hand. Slow moving people in the street…you try to overtake them, so go right, they psychically sense this, so they too, move right. So you go to the left and, yep, they move to the left. Simple remedy, a few thousand volts to the back of their head and you can step over their twitching unconscious body. It would make some stuff inconvenient, but if it was just one hand, or activated by a cool word, then I’d still be able to high five people without incapacitating them. Yeah…patience is not one of my virtues. 15. Star Wars, Star Trek or Sci-Fi curious? Star Wars. Hands down. I like a bit of Star Trek, don’t get me wrong, but the Holy Trinity is etched upon my very soul. I have found with age though, that Return of the Jedi is a bit of a ballbuster, those damn Ewoks. But as long as you put aside the idiocy of an intergalactic, merciless Empire failing to see off four foot high teddy bears, who are armed with bows and rocks, then you’re all good. The prequels were a tad disappointing, but, there were elements in each which were cool. The Darth Maul/Qui-Gon/Obi-Wan fight was cool, and Revenge of the Sith, except for THAT moment, has more lightsaber battles than you can shake a stick at. Yes, a lot of people go out in really stupid ways, but c’mon, they weren’t all terrible. Except for Attack of the Clones, that should be unmade. 16. 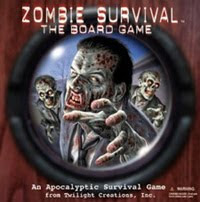 Do you think roleplaying games and video games are good practice for the impending zombie apocalypse? 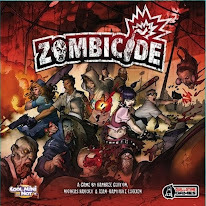 I think games like Zombicide encourage teamwork, an evening on that brings people together and forces them to look at the bigger picture rather than the atypical ‘everyone for themselves’ thing that most games have. Left 4 Dead, (though I’d argue they aren’t zombies) is pretty good at again making sure you have someone’s back, as two guns are better than one. Dead Rising is excellent for encouraging a little creativity. Out of all of them though, State of Decay is probably the one which you should play as it’s basically an Undead Sims. You gotta deal with community then, and the bigger picture, where each and every death is something you mourn, rather than just hitting ‘start from the last checkpoint’. 17. Do you think the influx in zombies in entertainment has reached its apex or is there plenty more to come? I think a lot of people in the media would like us to believe that the wave has well and truly broken and that it’ll all come smashing down to the shore soon. But unless I’m mistaken, I’ve been reading these articles for nigh on seven or eight years now. I think at the moment, the zombie stock has never been higher. They’re in the mainstream, The Walking Dead TV show has just gone mental, you have ‘normal’ people watching it in their droves. 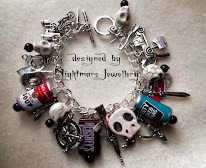 As with anything, it will eventually wane, but the genre itself is now so thoroughly interwoven into culture and society, that there will always be people that want more and more undead entertainment. 18. What’s your favourite Zombie video game or have they still not made one quite right yet? I’d have to say the first Dead Rising. State of Decay sure comes close to it, but DR just grabbed me. I blame Dawn of the Dead, that film is the pinnacle of zombie movies, and the opportunity to be thrown into a shopping mall, with endless numbers of zombies and a vast array of weaponry, was just mind-blowing. Yes, it has issues, but what game doesn’t? 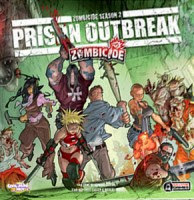 For mindless zombie killing fun, with the joypad throwing psycho’s thrown in for good measure, you’d struggle to top it. 19. Do you have a guilty pleasure you are willing to share? An interest completely unrelated to zombies? Most of my other interests are pretty mundane, video games, music, skipping from puddle to puddle whilst humming Nickleback b-sides. Not sure if it counts, but I love a good font. That’s not a euphemism by the way. When I get my books finished, one of my favourite parts of the whole process is going through dafont.com and seeing which font I’m going to use for the front cover and chapter headers. 20. What’s next for Duncan Bradshaw? I’m currently working on a non-zombie book, which is very odd. With both Class Three and the first book in the Class Four trilogy, they pretty much wrote themselves, this one has been a bit like pulling teeth at times. But, I want to prove to myself that I can do it, it’s a bit of a far out concept, but has plenty of gore in it. Not quite prepared to let too many details out yet, but you can find out on my website or Facebook. 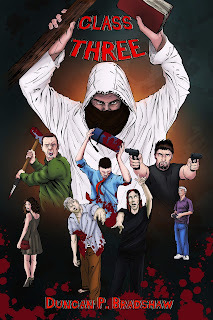 My main love though is still writing about zombies, and towards the end of the year, I’ll be starting work on book two of the Class Four trilogy. It’s called Versus, and picks up with a number of characters from the first two books and a third faction. They all go head to head, hence the title, and there will be all kinds of mayhem, and probably, some cool zombies in there too. I’m aiming for it to be released mid-2016, so again, hit me up on Facebook to keep up to date with the progress.